Jitsi vs Skype. 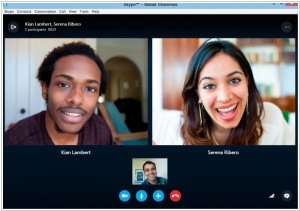 What is the best of Web Conferencing services? Jitsi is an audio/video Internet phone and instant messenger written in Java. It supports some of the most popular instant messaging and telephony protocols such as SIP, Jabber/XMPP (and hence Facebook and Google Talk), AIM, ICQ, MSN, Yahoo! Messenger. Skype (or Microsoft ?) 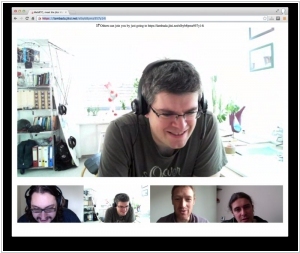 team from time to time invents some strange projects and tries to link them to Skype. For example, a year ago they tried to launch the social network Skype In The Workspace. And earlier this month they created Skype Collaboration Project. It's a site for creative people where they can get closer to the industries they love, get inspired and get on ... blah blah blah ... Victoria Beckham ... blah blah blah. At least, this project resulted in the substantial benefit: in order to draw attention to this site Skype is running the great holiday promotion. Anyone who visit Skype Collaboration Project and enter email, can get Skype's premium account features for the whole next year. It includes group video chat, screen-sharing and no advertising.